The MAKO® 21 LTS is an aggressive inshore predator that's ready for any inshore challenge. Built to specs supplied by top redfish tournament pros, the 21 LTS sports our patented Rapid Planing System transom and MAKO performance fiberglass hull. This gets you on plane fast, increases engine efficiency and increases top-end speed by feeding air-free water directly into the prop. The hull/deck joint is chemically bonded 360° and mechanically fastened every 6" with stainless steel fasteners for a lifetime of durability. 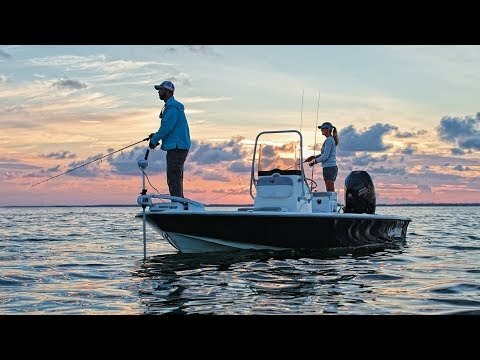 And the 21 LTS comes with a MAKO tandem-axle aluminum trailer and a Mercury® outboard—you can optionally power up to 225 horsepower. Max. person, motor & gear weight: 2100 lbs. Transom height at center line: 27"
Average hull weight: 2100 lbs. Average package weight: 3310 lbs.